Where are my worksheet tabs? If you can't see the worksheet tabs at the bottom of your Excel workbook, browse the table below to find the potential cause and solution. Note: The image in this article are from Excel 2016. Y﻿our view might be slightly different if you have a different version, but the functionality is the same (unless otherwise noted). The window sizing is keeping the tabs hidden. If you restore multiple windows in Excel, ensure that the windows are not overlapping. Perhaps the top of an Excel window is covering the worksheet tabs of another window. The status bar has been moved all the way up to the Formula Bar. Tabs can also disappear if your computer screen resolution is higher than that of the person who last saved the workbook. Try maximizing the window to reveal the tabs. Simply double-click the window title bar. If you still don't see the tabs, click View > Arrange All > Tiled > OK. The Show sheet tabs setting is turned off. 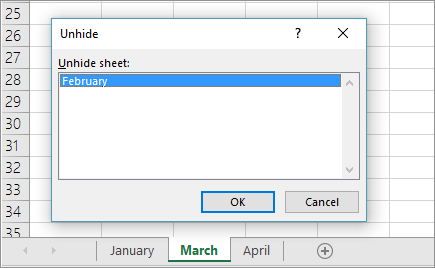 For all other Excel versions, click File > Options > Advanced—in under Display options for this workbook—and then ensure that there is a check in the Show sheet tabs box. If you are using Excel 2007, click the Microsoft Office button > Excel Options > Advanced category, and under Display options for this workbook, ensure the that there is a check in the Show sheet tabs box. 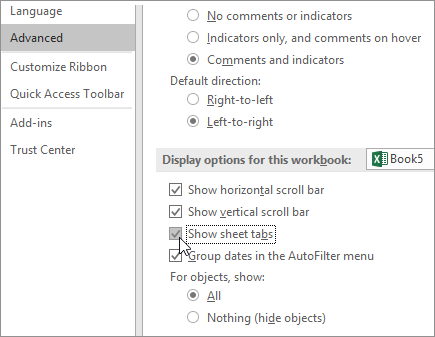 Note: In Excel 2007, you may not see worksheet tabs after adding a macro sheet to a workbook. 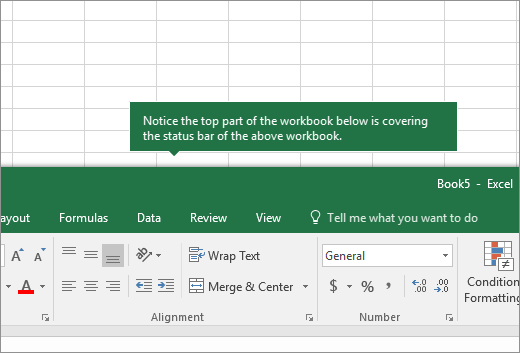 For more information, see Worksheet tabs disappear when you change some "Display options for this workbook" options and then add a macro worksheet to a workbook in Excel 2007. The horizontal scroll bar obscures the tabs. Hover the mouse pointer at the edge of the scrollbar until you see the double-headed arrow (see the figure). Click-and-drag the arrow to the right, until you see the complete tab name and any other tabs. The worksheet itself is hidden. To unhide a worksheet, right-click on any visible tab and then click Unhide. In the Unhide dialog box, click the sheet you want to unhide and then click OK.